The Best Lentil Soup on the Planet! When it’s winter, it’s hard not to think about a nice bowl of comforting soup to get all those “warm belly feels” happening in the kitchen. Soup is one of those things that is usually quick and simple to make and, for the most part, is freezer friendly so you can have a belly full of warmth whenever you need it. I also love soup because it stays in the fridge for days (and the taste usually gets better as the days progress because all of the flavours usually “marry” together and makes for a better soup in the end!). So, pull together a few of these ingredients (many of which you can change up if you like) and lets get started! Get all the parts of the soup ready…because we will literally be throwing them in as we go so I think its better to have it all done beforehand!! Now is the time to add your lentils…and if you aren’t going to use meat but want the smokiness flavour component, grab yourself a bottle of liquid smoke. It lasts forever in your fridge – but add a small amount at first because you don’t want to overdo it with this!!! I mentioned this in the recipe portion, but if you have a can of whole tomatoes and need to chop them, a quick way is to put a pair of kitchen shears into the can and cut right in the can!!! Now you can pour the stock in and let it have fun in the pot as it cooks away. And then, if you have any leftovers, use this amazing way to freeze your leftover soup…you can thank me later!!! 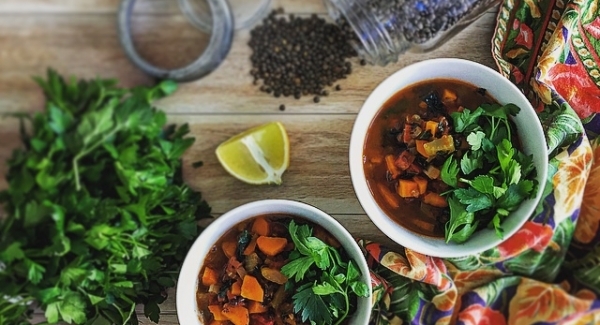 The Best (and easiest) Lentil Soup on the Planet! Whip up this bowl of goodness and you will have a table full of happy campers!!!! 1 cup diced smokey ham (optional but gives it a lovely smoky depth). In a large soup pot, heat ¼ c olive oil over medium heat and cook onion, celery and carrots until tender (about 5 -7 minutes). Add lentils and ham and stir to combine. Add stock and tomatoes and stir the contents of the pot until well combined; taste and season and then cover the pot and cook about 15 minutes or until lentils are tender. If using, add chopped greens and stir to combine. In a separate small pan, add ¼ c olive oil and heat over low heat; add minced garlic and cook over low heat to flavour the oil (you don't want them to get brown. After a few minutes, add the oil/garlic mix to the soup pot and stir. Taste again and re-season if necessary. Serve with crusty bread and a nice salad to round out your meal!